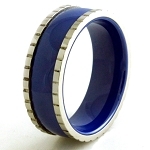 Known for being lightweight and extremely durable, ceramic rings are a fantastic option for men. Most men are not used to wearing a ring, and often damage or lose it at first. This is a great choice for the modern day man because it can withstand any scratches and minor damages. We have a fantastic selection from the best designers for you to look through! Our ceramic rings look and feel authentic, and are true to size. Finding the perfect fit is extremely important for all men. We can definitely accomplish that while providing your favorite choice just for you. The use of ceramic has been widely used lately and has been considered on the cutting edge of technology. Top designers are starting to catch on with this trend, and really love what they can create with this material. The color is bold and makes you stand out from others. These shiny pieces can be worn anytime, anywhere. They’re also suitable for job-related reasons compared to other metallic jewelry that isn’t allowed, or may be considered dangerous in some fields of work. Our choices are 100% scratch-proof and maintain a stunning shine that will last a lifetime. It is made from high grade, durable materials that will fit comfortably, and look remarkable. We have many innovative designs that could fit your style perfectly. Whether you want a fancy design that will stand out, or a one colored classic look, we have just what you’re looking for. Our ceramic rings are extremely durable and less expensive than a traditional wedding ring. It will hold its color longer, and feel more comfortable when you find the right fit. We have many popular styles that feature polished edges, satin finishes, and many more! Ceramic rings are changing the game; everyone was used to shopping for the traditional metal choices. Now, you have even more choices and a wider variety to choose from. This is a resilient material that is perfect for everything you do in your life. You won’t have to worry about it breaking or scratching. If you need assistance finding the best choice for you, don’t hesitate to contact us.